Update: this tutorial has been updated mainly up to Spark 1.6.2 (with a minor detail regarding Spark 2.0), which is not the most recent version of Spark at the moment of updating of this post. Nonetheless, for the operations exemplified you can pretty much rest assured that the API has not changed substantially. I will try to do my best to update and point out these differences when they occur. SparkSQL has become one of the core modules of Spark ecosystem (with its API already available for all currently supported languages, namely Scala, Java, Python, and R), and is intended to allow you to structure data into named columns (instead of with raw data without a schema as with RDDs) which can be queried with SQL syntax taking advantage of a distributed query engine running in the background. In practical terms, you can very much think of it as equivalent as an attempt to emulate the API’s of popular dataframes in R or Python pandas, as well as SQL tables. However, if I do my job correctly, I succeed in proving you that they are not the same (and hopefully more). Note: we use “s3n” prefix which is valid for a serious of regions in AWS, but not valid for all of them. For example, to access S3 buckets in Frankfurt region you would rather use “s3a” as a prefix. The second most obvious difference (compared to pandas df) is the distributed nature of a Spark Dataframe, similarly as RDDs are. As a matter a fact,in previous versions of Spark Dataframes were even called SchemaRDD. So internally the same redundancy principles of RDDs apply, you should in fact still keep in mind the Driver – Executor programming model, as well as Actions and Transformations concept. Let us view some useful operations one can perform with spark dfs. For the sake of brevity I will continue this tutorial mainly using the python API, as the syntax does not really vary that much. The dataset is minimal for the example, so it really does not make a difference to cache it in memory. But my point is to illustrate that similarly to RDDs, you should also care about memory persistence, and can indeed use a similar API. Moreover, since next we are going to use several distinct operations of type “Action” (yielding back results to the driver), it is of good practice to signal that this dataframe should be kept in memory for further operations. ... And, as expected, they are 10 in total. Being a categorical variable, as you can see the summary regarding the ‘category’ column does not make much sense. We’ll work on better on this later, but for now, let’s do something simple and try to look into product_name and category. Let’s suppose we are interested in finding out how does purchasing behavior vary among categories, namely what is the average frequency of purchases per category. Note: “count” column does not have much meaning here; it simply counts number of rows blindly, and as expected since the rows without a given value are filled with “zero” instead of Null, it counts them too. Let’s check the same for products. Note that this does not take into account the quantity of each product bought, just how many times client was there to buy a given item. For our last question that may be OK, because we understand the different nature of products. Hope this has been a good introduction, and I suggest that you further check out this great post from databricks covering similar operations. For the last part of this tutorial series I plan to cover window functions, something that until the more recent Spark 2.0 was possible thanks to HiveContext. This is part of a series of introductory posts about Spark, meant to help beginners getting started with it. Hope it helps! So what’s that funky business people call Spark? Essentially Apache Spark is a framework for distributing parallel computational (inherently iterative) work across many nodes in a cluster of servers maintaining high performance and High Availability (HA) while working with commodity servers. It abstracts core complexities that distributed computing activities are subject to (such as resource scheduling, job submission and execution, tracking, message passing between nodes, etc), and provides developers a higher level API – in Java, Python, R and Scala – to manipulate and work with data. Why is everyone going crazzy about it? Well, thanks to some cool features (such as in-memory caching, lazy evaluation of some operations, etc), it has been doing pretty well lately in performance benchmarks. In this article I want to avoid getting into more engineering details about Spark, and focus more on developer basic concepts; but it’s always useful to have some general idea. Spark requires scala programming language to run, and (as you probably guessed) Java Runtime Environment (JRE) and Java Development Kit (JDK) installed. A Spark cluster is made up of two main types of processes: a driver program, and worker program (where executors run). To its core, the programming model is that the driver passes functions to be executed on the worker nodes, which eventually return a value to the driver. The worker programs can run either on cluster nodes, or on local threads, and they perform compute operations on data. OK, enough chit-chat, lets get our hands dirty. In case the procrastinator side of you is preparing to hit ctrl+w with the pseudo-sophisticated argument that you can’t run spark except on a cluster, well I’ve got bad news.. Spark can be run using the built-in standalone cluster scheduler in the local mode (e.g. driver and executors processes running within the same JVM – single multithreaded instance). Please note that when you access Spark from the shell (only available for Scala & Python), the sparkContext is bootstrapped automatically for you (in local mode), and in Python and Scala you access this object by referencing “sc” (which, if you look carefully, the shell also instructs you). The first core concept to learn are Spark’s own data collection structure, the Resilient Distributed Datasets (RDDs). RDDs are immutable collections of records that are split and spread across cluster nodes, and saved either in memory or disk. Another interesting property is that RDDs are fault-tolerant: data can be rebuilt even on node failure. Please give a warm welcome to RDDs, because if you want to “talk parallel lingo”, RDDs are your new best friends and currency when dealing with Spark. 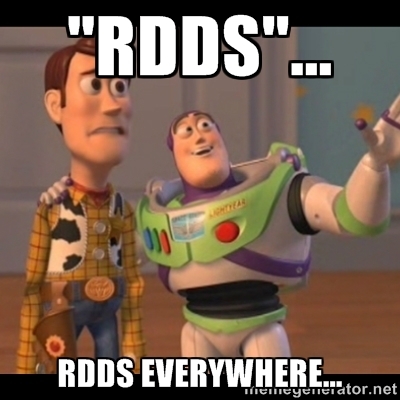 Please keep in mind that although the list in python is a mutable object, passing it the RDD creation will obviously have no reflection on RDDs immutable nature. Much like tuples in Python, operations you do on RDDs will create a new object. This means that our second option on how to create an RDD is.. from another already existing RDD. This was obviously a silly example, but the important part to take into consideration is that depending on the number of nodes on your cluster, or if running locally on the number of threads specified initially in SparkContext constructor (..local in our example), Spark will automatically take care of splitting RDD’s data among workers (e.g. nodes or threads). In case you are wondering if you can change per RDD how many partitions/splits are created, the answer is yes. Both methods parallelize() and textFile (as we will see next) accept an additional parameter, where you can specify an integer. Besides collections (created in the driver program) and transformations on other RDDs, you can also create RDDs by referencing external sources, such as local file system, distributed file systems (hdfs), cloud storage (S3), Cassandra, HBase, etc. Though you can also use the SparkContext textFile() method for grapping files from AWS S3, heads up for some possible issues. You should also keep in mind that RDDs are lazily evaluated. In other words, only when you actually perform an action (we will get into that in just a few seconds) computation on it. As a matter a fact even on the case of loading a file with the textFile() method, all you are doing is storing a pointer to the file location. Now, before you get all excited to perform operations on RDDs, there is yet another important aspect to grasp. There are two main types of operations that can be applied on RDDs, namely: actions and transformations. The key distinctions between the two is that transformations are lazily evaluated and create new RDDs from existing ones, where actions are immediately evaluated and return values to the driver program. In other words, you can think of transformations as just recipes of data, and transformations the real cooking. On our first line we are simply performing transformations on our base RDD (distData), namely map and filter operations. Furthermore, if you are following along with Spark shell, then it will be clear to you that only when you execute the second line – with the action reduce – that Spark will “wake up” and perform the desired transformations on each worker node plus the reduce action, and finally return the result to the driver. As you can see, you can conveniently chain several transformations on RDDs, which will upon an action be computed in memory fashion on worker nodes. Moreover, all of these operations – both transformations (map +filter) and action (reduce) occurred in memory, without having to store intermediate results on disk. This is one of the main secrets that make benchmarks from Spark agains Hadoop’s MapReduce jobs so disproportionately different. However, after returning values to the driver, these RDDs will be cleared from memory for further computations. Now before you panic, the good folks at Berkley anticipated your wish, and there is a method you can call on an RDD to persist it in cache. In our example, to persist the derivateData in memory, we should call .cache() or .persist() method on it before calling any action. In part 2, I will cover Spark DataFrames, also equally important. In the meanwhile, where to go next? Here’s a suggestion: Berkley AMPcamp Introduction exercises.